Lost compensation is a method of capturing economic damages in personal injury, medical malpractice, wrongful termination, failure to promote and other similar torts. Independent damages experts are often employed to calculate lost compensation because of their unique background/skill set. However, the desire to minimize costs means that these experts are often employed after settlement efforts failed. This presents a difficult situation for counsel who are negotiating settlement without the benefit of the expert's opinion regarding damages. 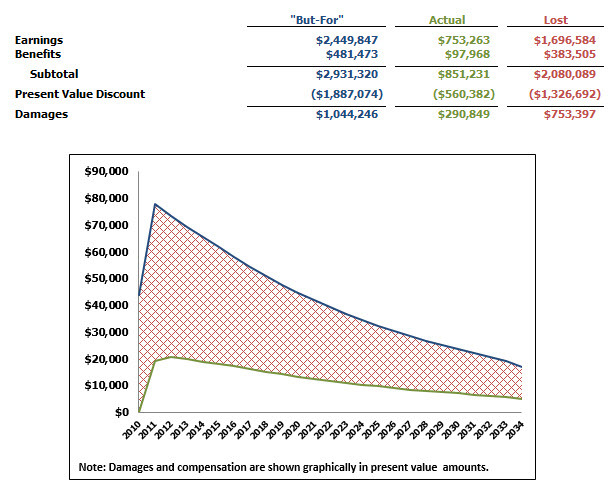 Conceptually, lost compensation is what Plaintiff should have earned had the alleged incident not occurred (aka "but-for" compensation) less actual compensation (aka "mitigation"), discounted to present value. Although the concept may be relatively simple to describe, the data underlying the calculations varies significantly, as does the final result. 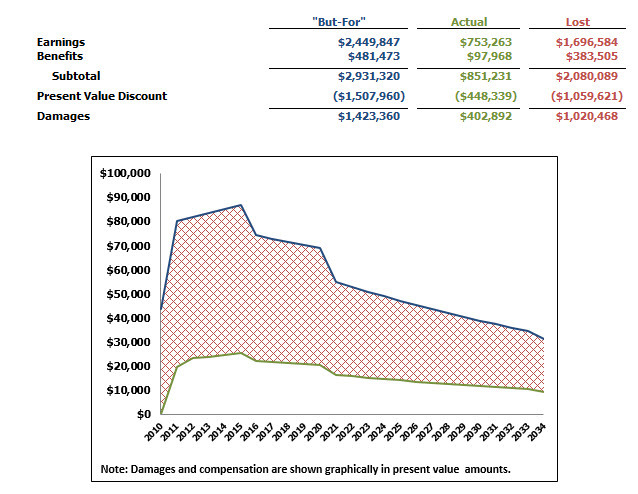 The data underlying the calculations is a combination of (i) data specific to an individual Plaintiff and (ii) application of appropriate and credible statistics, all of which must be distilled into a proper methodology for damage computation. Ideally one would have the full benefit of the testifying expert's opinions prior to settlement negotiations. However, access to an interactive settlement tool can provide counsel with the information necessary to provide meaningful advice to the client about appropriate damage amounts. This knowledge can also assist with settlement discussions in general by demonstrating that amounts requested/offered are based on application of defined inputs, properly applied. If necessary, the model can also be customized to include fact patterns that are unique to a particular case. The interactive feature allows you to immediately see how various inputs affect the economic damage conclusion and enables scenario building. This facilitates preparation and assessment of settlement offers. Some of the more common points of disagreement amongst opposing sides of a lost earnings case include the appropriate discount rate, future earnings and earnings growth rates, and future employment fringe benefits. All of these variables/inputs (among others) can be altered in the model and presented in various combinations. The specific analysis presented in the above calculations and the accompanying graphics will demonstrate the thoughtful analysis underlying your settlement demand/offer.